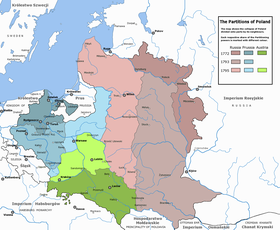 ↑ "Partitions of Poland". Encyclopædia Britannica Online. 2008. 喺8 June 2011搵到. ↑ Bideleux, Robert; Jeffries, Ian (1998). A History of Eastern Europe: Crisis and Change. Routledge. 第 156頁. ↑ Batt, Judy; Wolczuk, Kataryna (2002). Region, State and Identity in Central and Eastern Europe. Routledge. 第 153頁. ↑ Sinkoff, Nancy (2004). Out of the Shtetl: Making Jews Modern in the Polish Borderlands. Society of Biblical Literature. 第 271頁.